Meanwhile, lightly coat a large skillet with cooking spray and heat over medium heat. Add ground turkey and cook until lightly browned. Add onion and bell pepper and cook, stirring often, until softened, 3 to 5 minutes. Stir in tomatoes, chile pepper, corn, beans, and s&p. Cover, reduce heat, and simmer until the tomatoes are broken down, 10 to 12 minutes. 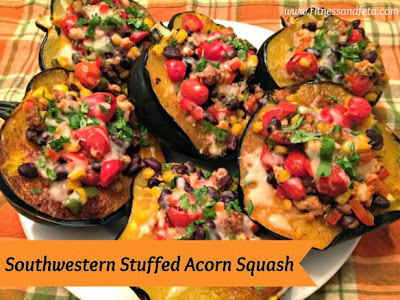 When the squash are tender, reduce oven temperature to 325°. Fill the squash halves with the turkey mixture. Top with cheese. Place on the baking sheet and bake until the filling is heated through and the cheese is melted, 8 to 10 minutes. Once complete, sprinkle with cilantro and enjoy!